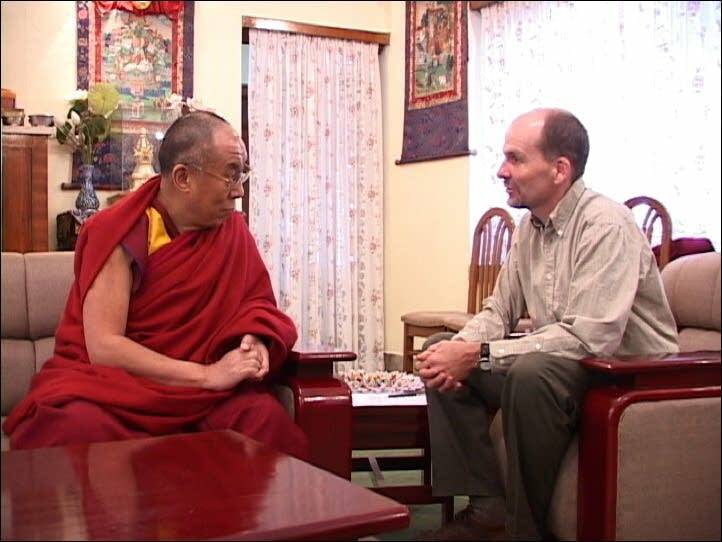 Rick Ray's search for "10 Questions for the Dalai Lama"
Rick Ray makes travel films. A few years back he was lured to India with the offer of job. The production company didn't promise much money, but the gig did include an interview with the Dalai Lama at his home in Dharamsala in northern India. The Tibetan leader has lived there since 1959 when he fled the Chinese invasion of his country. Yet when Ray arrived in India no-one knew anything about the supposed interview. And that's when fate lent a hand. Or as Ray puts it: in India magic happens. "Of all people, my driver, an 80 year old man who took me up to the state of Himachal Predesh, told me we would write to the Dalai Lama and propose a meeting with him," Ray says. Ray admits he was skeptical, given what he knew about the Indian postal system. then the driver said he wasn't suggesting a letter, but an e-mail. He just happened to have the Dalai Lamas e-mail address. Again Ray was skeptical - but he went to a cyber cafe and sent off his request. "The e-mail was his actual e-mail and within just a few days I received a response. It was three months down the road. They said you are welcome to come to the monastery. You are welcome to meet with him for an hour, have an interview with him alone in three months, and thus a film was born." The e-mail stipulated he would be allowed only 10 questions. Ray spent the next 90 days travelling and preparing his list. Along the way Ray learned that the promised hour might not be an hour at all. The Dalai Lama has a habit of cutting interviews short if he feels the interviewer is insincere. Eventually the day came and Ray felt the pressure mounting. In addition to wondering if he had the right 10 questions, he wrestled with setting up his camera equipment, and his nerves. Things changed when the Dalai Lama arrived. "But when he walks in, the moment he walks in, he is "the presence," and that's really what the name 'Kundun' means, 'the Presence,' Ray says. "He walks in and you feel his warmth. He's smiling, he's kind of kidding around. He walks over to every person in the room and offers them a greeting scarf and hugs them, shakes their hand, looks them in the eye. And if you can't be comfortable after that, then you probably do have some problems relaxing somehow." The interview went over an hour. They talked about religion and philosophy, politics and history. They talked about non-violence, and dealing with the Chinese. They talked about truth, faith and science. "Another question that he answered surprisingly was 'When do you evolve religious doctrine when faced with scientific fact?'" Ray says. "And he is the first to tell you that if science disproves faith, well maybe faith should evolve." Ray found that even though he had his interview with the Dalai Lama, he needed much more to complete the film. He then spent three years searching obscure film archives around the world for historical footage of Tibet and the Dalai Lama before and after the Chinese invasion. He also received video from Tibetan activists of conditions in Tibetan prisons, and arranged for more to be secretly shot to show life in Tibet as it is today. "When you see the backdrop, when you understand what the Dalai Lama's been though in his life, the suffering, it lends so much more meaning to his compassion," Rays says. Ray edited the film at home on his laptop. He says he was surprised and delighted when first friends praised the documentary and then film festivals came calling. "Ten Questions for the Dalai Lama" recently screened at the Twin Cities Tibetan Film Festival, and opens this weekend for a run at the Oak Street Cinema in Minneapolis. "He said when you leave a room, turn out the lights. 'You'll do a little good for the planet, you know?'" Ray says, gently mimicking the Dalai Lama's accent. "So one very deep profound idea, and one very practical one, and now I can't leave a room without looking around to make sure those lights are off." Rick Ray says he'd love to go back and ask another 10 questions, and if the film is a success, he hopes he may get a return invitation. Official site for "10 Questions for the Dalai Lama"